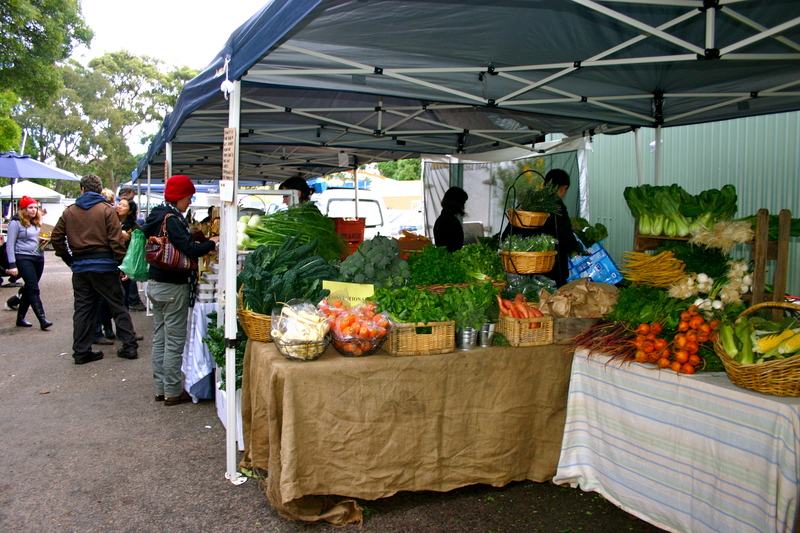 My favourite shopping destination in Sydney is, without a doubt, the Marrickville Organic Food & Farmers’ Market, held every Sunday from 8.30am at the Addison Road Community Centre, 142 Addison Road. 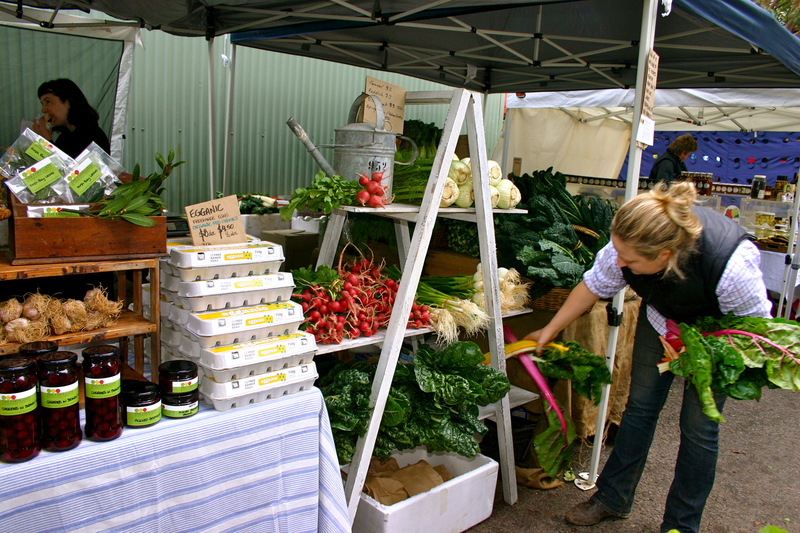 As a born-and-bred country girl who grew up in the Northern Rivers area of New South Wales, the market has more than a touch of Bellingen, Bangalow and Byron Bay about it. Indeed, once you walk through the gates of the Addison Road complex, you could be mistaken for thinking you had been transported to the Byron hinterland, and frankly, I hadn’t previously encountered such a proliferation of hippies outside this particular geographical location! 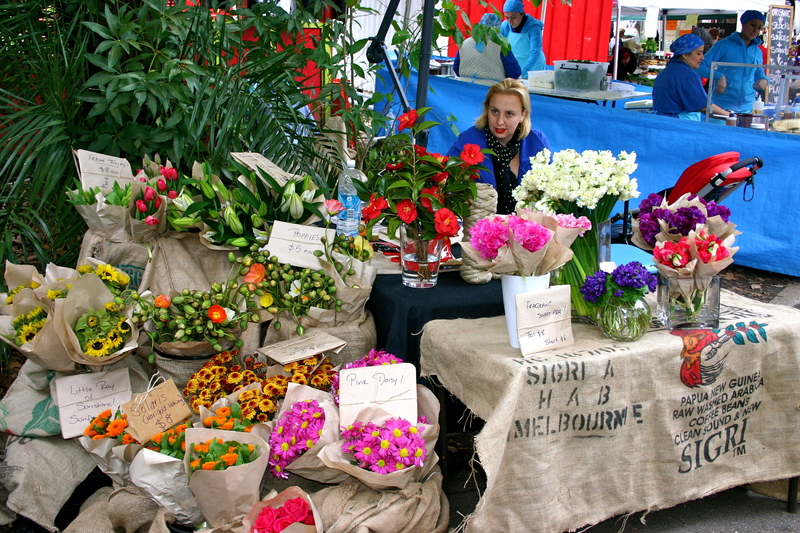 This is what distinguishes the Marrickville market from the many other farmers’ markets I have worked at and visited in Sydney such as the Good Living Growers’ Market in Pyrmont, the EQ Farmers’ Produce Market at Moore Park and the Eveleigh Farmers’ Market. These markets offer a veritable cornucopia of amazing produce, but with an emphasis on high-end specialist suppliers, I know I tend to haemorrhage money as soon as I walk in. 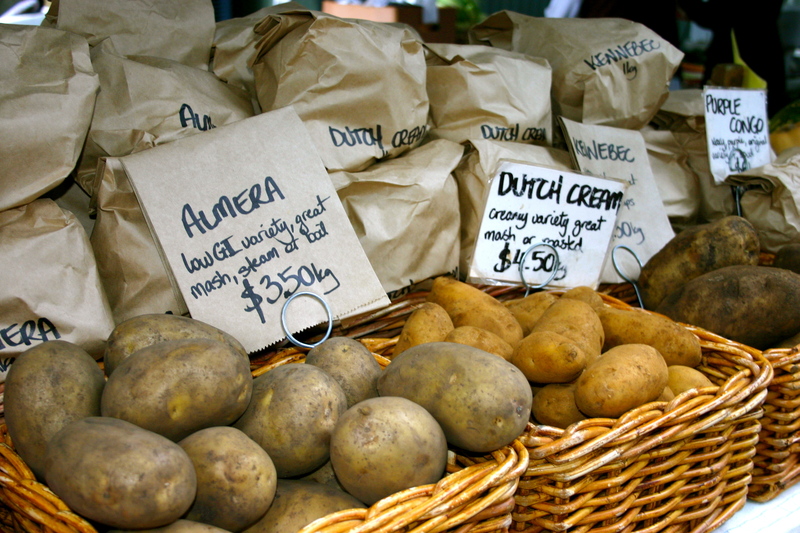 Marrickville is the kind of place you can do a weekly shop without breaking the bank, with a wide range of fresh produce, organic, chemical-free or conventional, as well as meat, bread, sweets and cheeses. 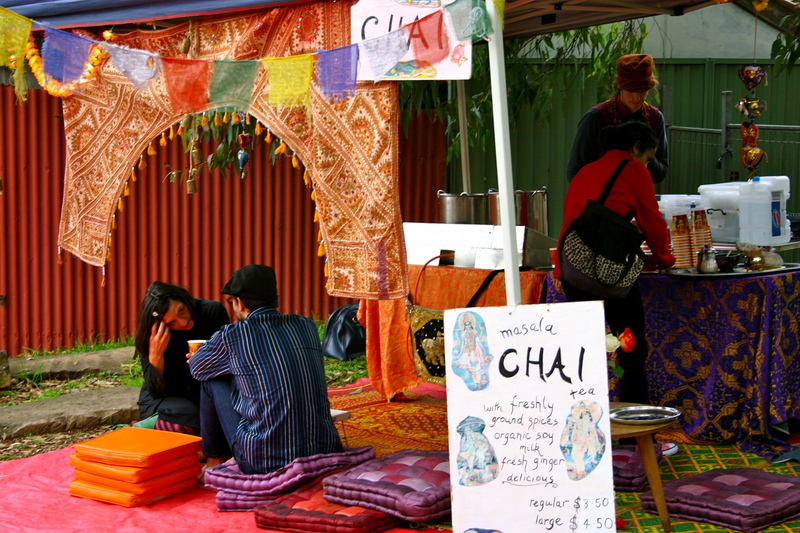 There are also lots of reasonably-priced snacking options from dumplings to dhal. Marrickville isn’t just my market of choice for the weekly shop, but also my favoured weekend social venue (this says so many things about me!) On a recent Sunday, I just hung around for the whole morning while friends from all over Sydney came and went with their children (both human and fur) and did their shopping. The kids love it, with sculptures to climb on, a jumping castle and a petting zoo (if you see a big kid cuddling a lamb to death, that’s probably me). Food isn’t the only thing on offer either, with the back half of the market devoted to plants, organic seedlings for your garden, second-hand clothing, books, small designers and, well, a bunch of crazy crap. Second-hand furniture, vintage ceramics, antique garden gnomes, that kind of thing. The Addison Road complex is also home to The Bower Re-use and Repair Centre Co-op and Reverse Garbage, hubs of recycling and creativity. Of all the reasons I love Marrickville markets though, the best is visiting my friends and colleagues Katie and Beau from The Farm Gate by Nashdale Fruit Co. Though I’ve spent many long mornings (you don’t know how long a morning can really be until you’ve pretended to be a farmer!) working for them at Marrickville and other markets, I have the luxury of being on the other side of the counter until I move back to Sydney permanently. On my recent visit, I was amazed at just how much their business had grown since I was last there, with even more produce than ever, including some incredible heirloom root vegetables and new varieties of potatoes. 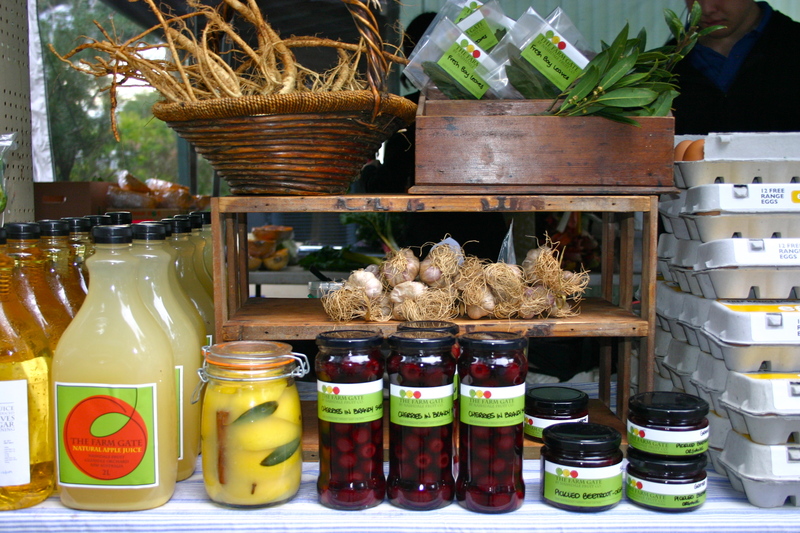 The most exciting development however is their new range of homemade preserves, bottling their amazing produce at its peak to enjoy all-year-round. They are also the perfect size for hauling back to Grafton (along with a few kilos of apples, more unwieldy, but I am addicted to them. Addicted!) I picked up a bottle of cherries in brandy syrup, a tantalising reminder of the last cherry season, for $14. So far they have been included in a lush Basque tart, been the star of a batch of cherry macarons and used to marinate and accompany some simple seared duck breasts. I still have a quarter of the jar left which will probably just be used to top some nice vanilla ice cream. Here’s the recipe for the duck, which is so simple that it’s less of a recipe than a vague instruction. So simple, so delicious, and most importantly, incredibly impressive! The cherries are a perfect accompaniment to the duck, as the sugar in the syrup helps the skin to caramelise and crisp up, in that amazing way that only duck skin can. Allow one duck breast per person. Score the skin on the diagonal, forming diamond shapes; this helps the fat to render evenly. Cover with some of the cherry brandy syrup, season with salt and pepper, and allow to marinate for a couple of hours. 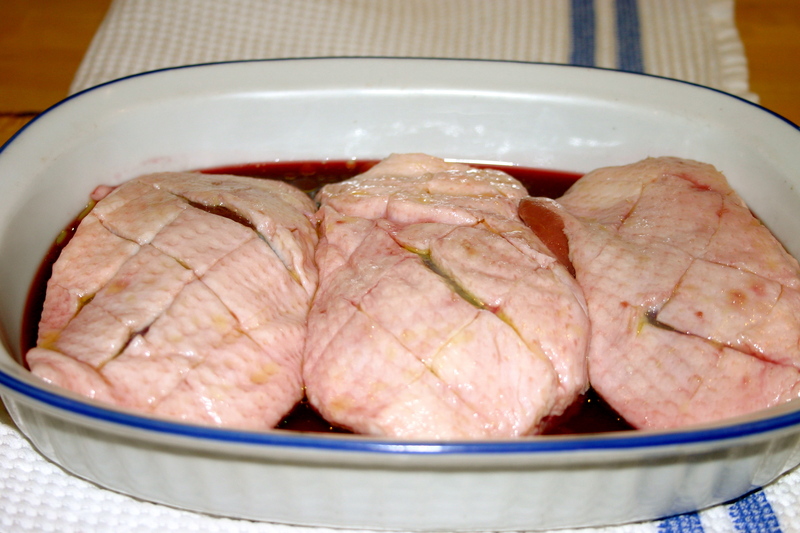 When ready to cook, remove the duck breasts from the marinade and reserve liquid. Using a cast-iron griddle pan (or non-stick frying pan) on a high heat, heat a splash of olive oil and cook the duck-breasts skin-side down for 6-8 minutes, then turn the duck over and continue to cook for 4 minutes, or until the flesh is cooked medium. Remove from heat, wrap loosely in foil, and rest for five minutes. While the duck is cooking, heat the remaining marinade liquid in a small saucepan with a few spoonfuls of cherries from the jar. Reduce to half, then finish with a knob of butter. 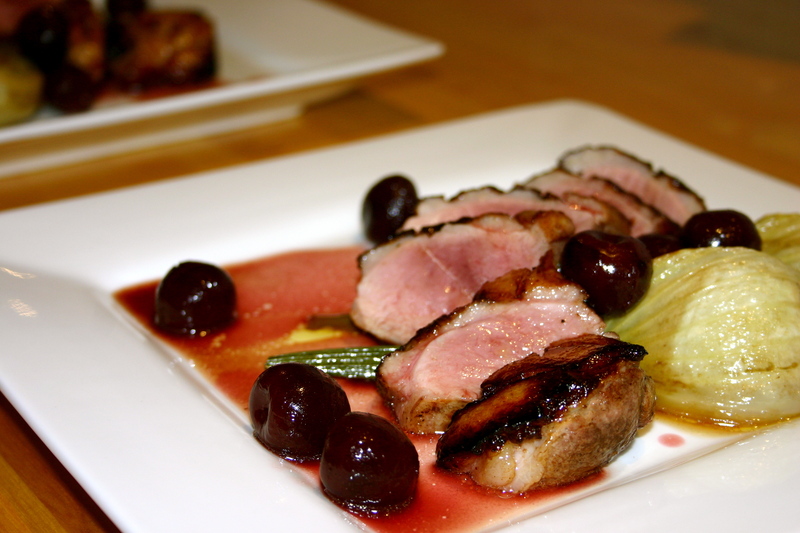 Slice each duck breast on the diagonal for serving, spooning over the cherries and syrup. We served our duck with roasted fennel, a simple potato gratin and some steamed carrots. Would you believe it is like 3 blocks from my house and I have never been. Looks like a trip there on Sunday could be on the program. I live three blocks away from these markets. Must go more often because it looks like there’s tonnes of new stuff there now (ie flowers – haven’t seen them before). Marrickville sounds delightful. I really like your photos – your shots are creative. 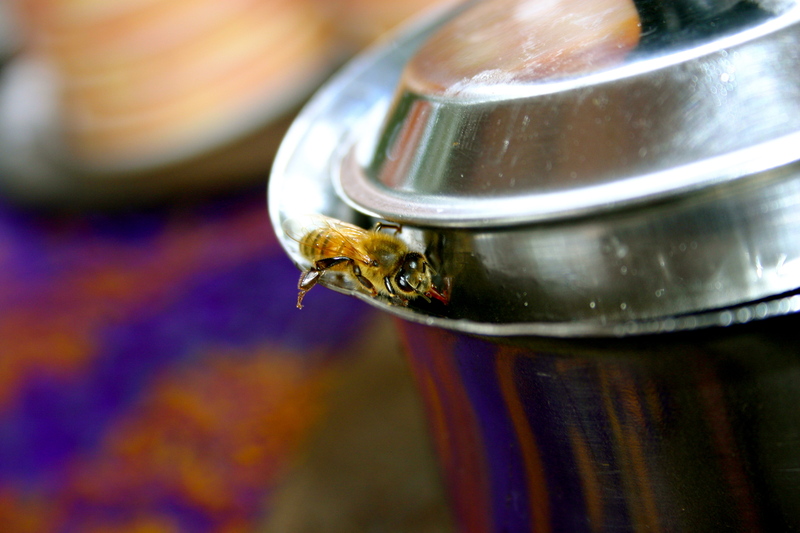 Love the bee. 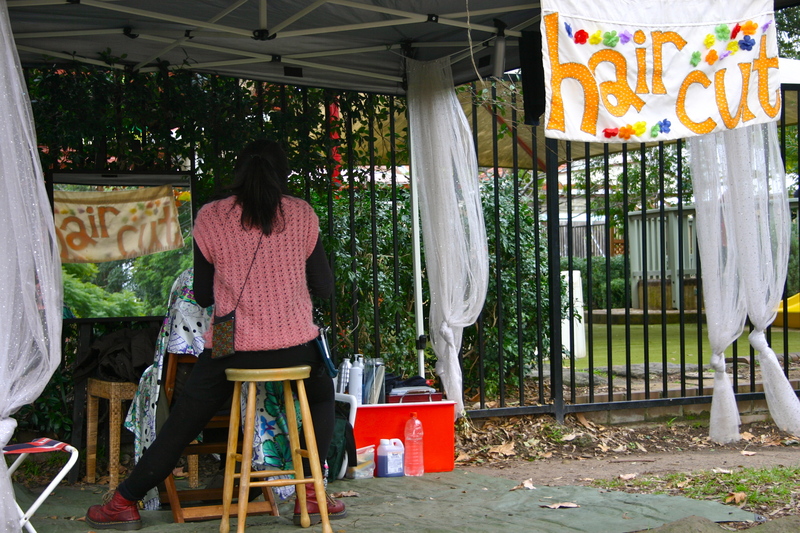 Well Marrickville is the Northern Rivers incarnated… Also the market has a touch of the Channon about it. Nice post and nice pics Flick. 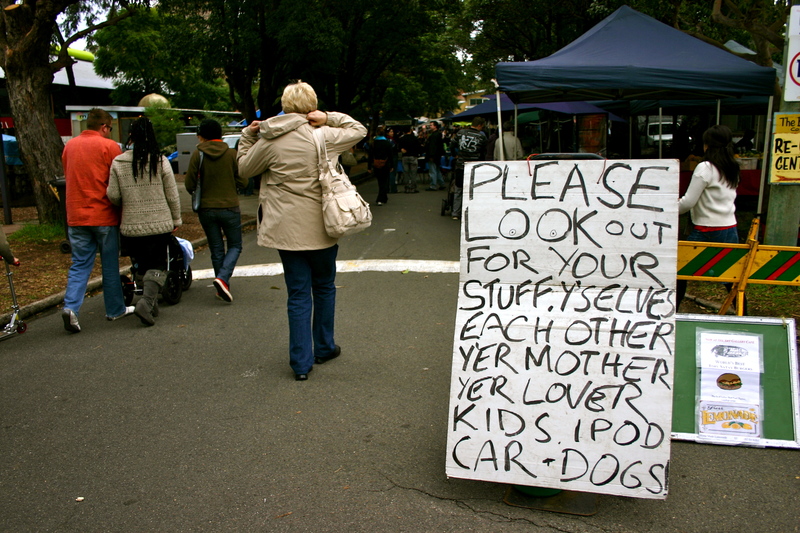 Not just me that thinks it is the best market in Sydney then. Have not been to Pyrmont for years and Eveleigh just feels like I’m being robbed. Yay for the local market! Trouble is, it’s spoiled me for shop meat (Saltbush Lamb rules! 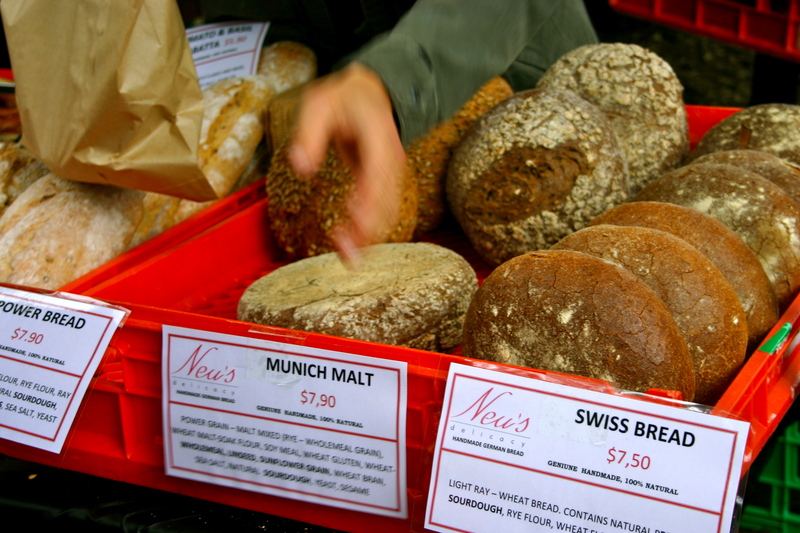 ), shop bread (Brasserie sourdough for the win), shop vegetables (Beau and Katie’s are the best) and snacks of all kinds. Your photos do it justice, Felix. lovely post and pix – very evocative. Even Orange Grove is paling in comparison these days. You likey? Subscribe why don't you! Enter your email address to subscribe to Cattle & Cane and receive notifications when Felix posts new adventures.